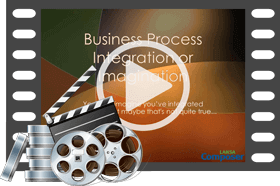 LANSA Composer delivers business process integration technology in a visual environment so business analysts, rather than developers, can integrate and automate business processes. It is a simple and cost-effective way to get business transactions in and out of your business systems with less human effort. LANSA Composer is compatible with all common interfaces; like web services, EDI, FTP and email. Smart processes handle unexpected events and interrupted sequences can resume from the point of failure and run to completion without loss of data or transaction integrity. With Composer’s data transformation tool, you can visually map data transformations using a drag-and-drop interface to transform data between different formats. Data transformation may include adding or changing data fields based on formula/rules or look-up tables. This is extremely useful when, for example, item codes, unit of measures or date formats need to be changed. Transform business information between XML, EDI (UN/EDIFACT and ANSI X12), HL7 (legacy EDI and XML V3.x), XBRL, JSON, Excel, text and database formats. Orchestrate transport, data transformation and other activities, pass variable data between them and apply conditional and structural directives to create multi-step business processes that can be executed and managed as a single unit. Business analysts use a simple process design canvas to wrap business logic as activities and combine them with industry standard data transformation and transport services to create business processes. Administrators and operations staff use the Document Manager to monitor and manage the transaction document flows. LANSA Composer is built on LANSA Integrator which provides the services to support virtually every transport mechanism and data format you might encounter. Who should use LANSA Composer? LANSA Composer is intended for use by business analysts to design and implement data transformation and business process integration solutions. Orchestrating transport, data transformation and many other tasks is accomplished using a visual user interface with drag-and-drop capability. A comprehensive range of built-in activities makes it possible for non-programmers to create simple solutions to complex problems without coding. Data transformations can address databases across your network. Built-in activities facilitate communications across your network. Processing sequences can invoke any executable on the same server, or LANSA functions on a remote networked server, and pass variable data in both directions. The invoked LANSA function, in turn, can call other executables. These and other features mean that, for example, the LANSA Composer server can run on a Windows server while integrating with databases and applications hosted on another Windows server or on an IBM i server. This capability expands deployment flexibility for LANSA Composer and extends its access to functions on other servers. LANSA Composer can be extended to encompass your custom business processing. You define custom activities that encapsulate the processing built by your developers. These custom activities are orchestrated in the same way as the LANSA-supplied transport and data transformation activities. LANSA Composer includes a developer toolkit that integrates A2A and B2B transactions through XML, JSON and over 30 plug-in Java services. It hides the technical aspects of integration and gives the flexibility to integrate transactions with your applications. The wizard-based web service development tools let you consume web services or expose existing code as a web service. 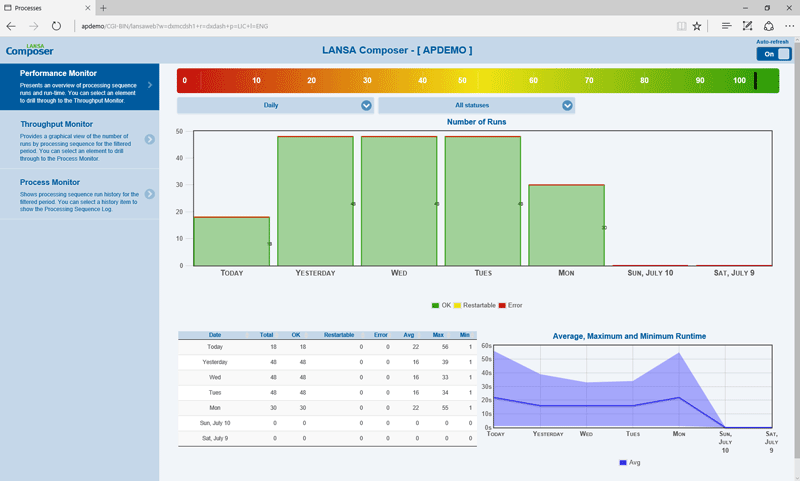 LANSA Composer can be deployed on Windows and IBM i servers. When deployed ‘on’ IBM i, or deployed on Windows with network access ‘to’ an IBM i server, there are some extra features available through integration with aXes (another LANSA product). Used in combination with aXes, LANSA Composer activities can automatically interact with 5250 applications to retrieve and send data. For example, take an order from an EDI document and enter it into an ERP system. To the 5250 application, LANSA Composer is a "data entry person". This allows you to integrate legacy 5250 RPG and COBOL programs without any change to their code, that way filling the last-mile data-entry gaps between the various tools and solutions. This 'aXes robot' feature is well illustrated in the Green's General Foods case study. LANSA Composer is equipped with a built-in transaction document database and a Document Manager. The Document Manager provides the ability to monitor and interrogate inbound and outbound transaction documents. 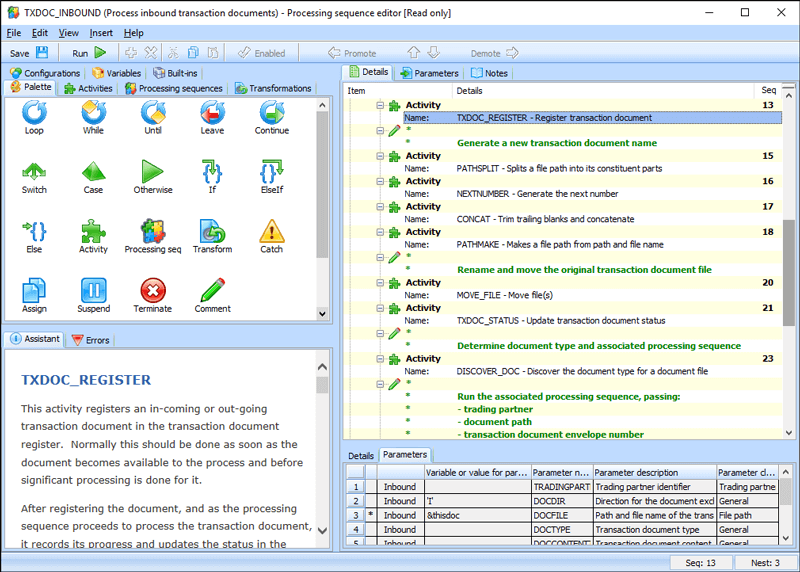 The Document Manger console shows the transaction documents associated with each inbound and outbound document flow. Using the Document Manager’s search facilities, you can search the database for transaction documents by a variety of criteria, such as by trading partner, status, transaction document and content type. LANSA Composer includes the ability to restart a failed processing sequence from the point of failure, for example, in the event of a communication failure with a remote FTP host. This capability is exploited in the Document Manager to enable you to resume processing for failed transaction documents after diagnosing and correcting the cause of the failure. The management console provides a web browser interface for monitoring day-to-day activity including run times and errors. Automated processes reduce costs by minimizing the need for human intervention and managing exceptions. LANSA Composer boosts productivity by providing most of the activities companies need for business process integration. With ready-made activities business analysts assemble the processes without writing program code. Assembling a process is faster than writing program code to manage the process. Because business analysts assemble processes, changing the processes is a straightforward task. Therefore, the processes are more readily adaptable to changes in business activity. In contrast, hard coded processes require developers to write new code and/or rewrite existing code before the process can change. Processes are less adaptable when more people are involved in implementing the changes. 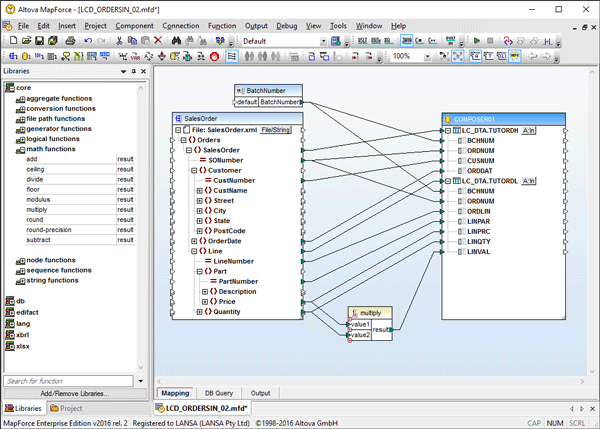 Drag-and-drop, graphical user interface for transformation mapping. Extract information from corporate databases to send as XML, EDI and other document formats to trading partners. Transform incoming XML, EDI and other document formats, and write directly to your database for processing by existing applications, and much more. Multilingual support for user interface. Define processing sequences visually using the Processing Sequence Editor – without coding. Processing sequences combine activities and data transformation maps with processing directives such as loops and conditions. Restart processing sequences from any point. POP3 for inbound and SMTP for outbound email. SMS (mobile phone text messages). Inbound and outbound transactions via message brokering systems such as IBM WebSphere MQ. Watch folders, data queues and message queues. Call existing 3GL, Java and other programs or execute Ruby scripts. Drive 5250 applications automatically when coupled with aXes. Browser-based management console for monitoring performance, throughput, processing sequences, history, and event logs provides operational insight for administrators. Document Manager for monitoring inbound and outbound transaction documents. 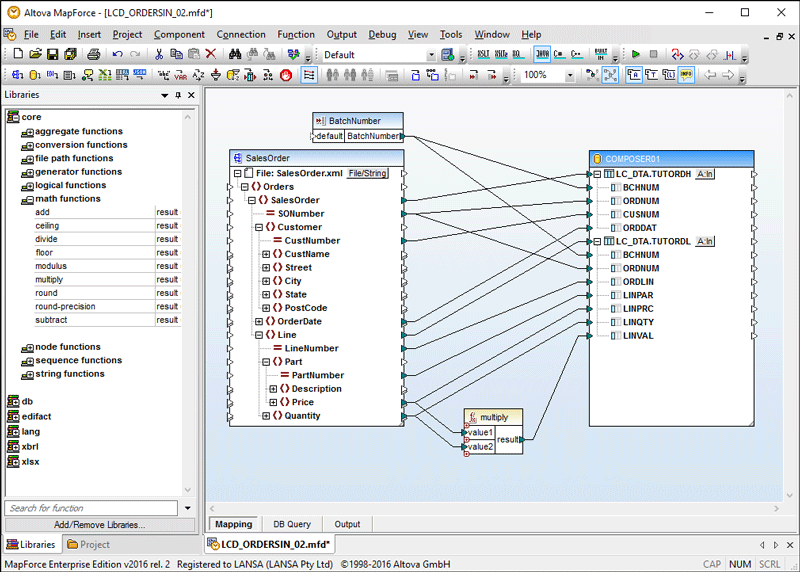 Configurations encapsulate the variable information required for common transport activities and for database connections. Create as many configurations as you need to define the information to connect or communicate with other parties. Activities, along with data transformation maps, implement specific business functions that are executed by processing sequences. Use immediately with the supplied activities to exchange business information such as orders and invoices with other parties, including external trading partners and internal business units, using standard protocols. Map data between disparate formats including: XML, EDI (UN/EDIFACT and ANSI X12), HL7 (legacy EDI and XML V3.x), XBRL, SAP iDOCS, IATA PADIS, Microsoft Excel 2007 (OO XML files), text files, web service functions and a wide range of databases including IBM DB2 and Microsoft SQL Server. Execute LANSA functions on remote systems. LANSA Composer's strength is its simplicity. No more hand cranking 3GL code and one product to manage trading partners, organize events and transform data. Once we installed LANSA Composer and completed the tutorials, which are very good, I was able to set up a test environment and complete a cycle just by going through them. It was a painless effort. LANSA Composer is easy to use, easy to learn and very intuitive, especially the mapping and transformation part as it's all GUI.